Designed specifically for MFI 34mm Steel Rings, but will work on similar sized rings at or near a width of 0.840". What you see in the first photo is what you get. 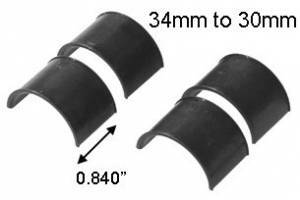 If your 34mm rings are 0.845" to 0.755" these will work great. Obviously they will work on smaller widths as well, but the reducing scope ring just sticks out and looks strange. Wider scope rings cannot be used with these unless you grind off one lip. Also known as Rifle Scope Ring Reducers and Reducing Inserts. TRUST YOUR LIFE TO QUALITY... NOT LOWEST PRICE!